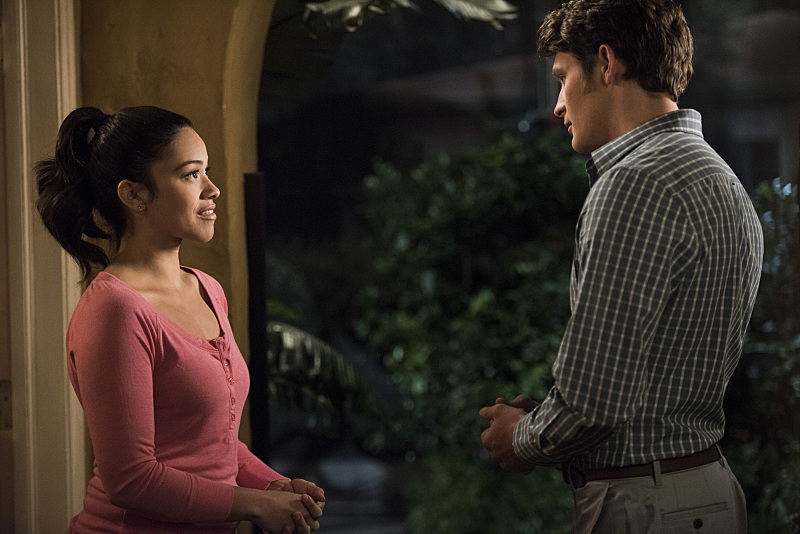 Welcome back to The Young Folks’ Jane the Virgin Season 2 coverage! Click here to read our previous coverage of the series. It’s a truth universally acknowledged, that… Jane and I have the same basketball skills—or lack thereof. What leads Jane to go one-on-one with a college basketball star who goes by McBaskets? Let’s break down the winter premiere of Jane the Virgin. 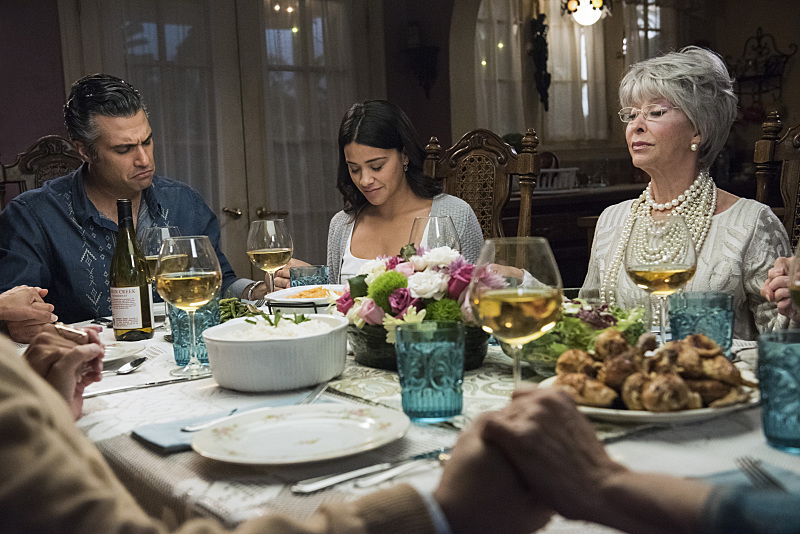 Jane the Virgin returns with quite a few new developments going on in Jane and her family’s lives. For one, baby Mateo isn’t sleeping, and Jane is ignoring her grandmother’s “cry it out” advice to train Mateo to sleep independently. The relevant and aptly-title “Sleeper Bowl” begins with Jane going through help books and new methods to make Mateo’s slumber last for longer than 20 minutes—with the aid of sports commentators breaking down her every move. It’s officially “game over” for Jane, and she takes her grandma’s advice, which works. Abuela knows best. That’s where the magical realism ends for Jane, who is also dealing with other pressing issues. She’s the teacher aid for lit class primarily occupied by jocks. It takes an inspired dose of determination and tough love (thanks, Alba) for Jane to get the stereotypical athletes to care about Pride and Prejudice. Surprisingly, Jane is successful except for one student (McBaskets), who plagiarizes his paper. Tired and stressed from lack of sleep, Jane—deservedly I might add—fails McBaskets. Of course, because the education system values sports above education, Jane’s boss calls her to give McBaskets another chance since he’s the star of the basketball team, and he can’t play if he’s failing a class. Resigned, yet still determined to make a difference, Jane gives McBaskets another chance with some strict rules. He’s about the shrug her off, when she baits him into a game of basketball. If she makes a shot, he needs to write his paper immediately. Jane never makes that shot, and frankly, that wasn’t the point. It’s the fact that she tried her best to make that shot no matter what the obstacles got in her way. That’s exactly the kind of thing that inspires people, and it shows a lot about her character and what she is capable of accomplishing. This is the one subplot in tonight’s episode that I truly enjoyed. It may not have been the funniest or the most serious, but it cleverly tackled many different things and got the right points across. I wish the rest of the episode was just as inspired. 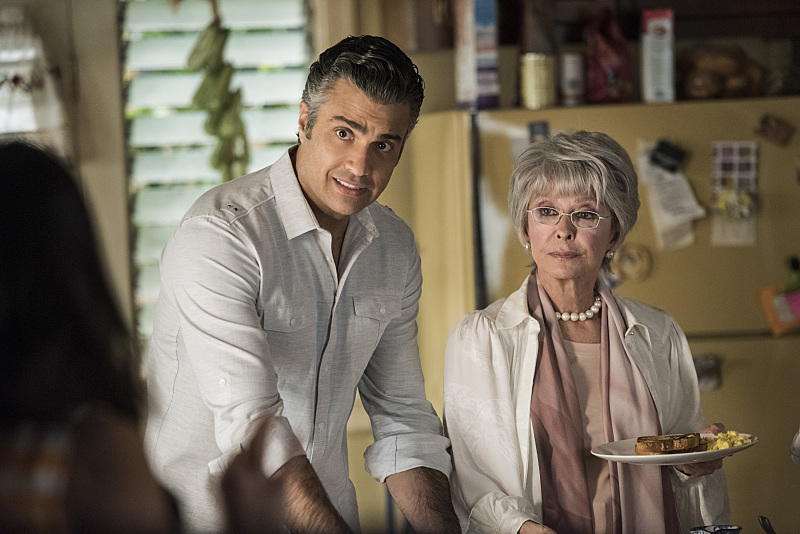 In one plotline, Rita Moreno returns to guest star as Rogelio’s mother, who comes to visit Jane and her new great grandson. Though, the reason for her visit is a secret that Jane learns of right away: Rogelio’s father is divorcing her because he’s gay and has fallen in love with a man. It’s not surprising for Jane the Virgin to pull out a bomb like this. I appreciated the fact that it didn’t overly exaggerate the situation. Rogelio’s reaction was rather subtle compared to his previous behavior, but like he says, he wasn’t that surprised that his Bette-Midler-loving dad is gay. Sin Rostro, who? The focus of the ongoing investigation has officially centered on Mutter, who we learn is Rafael’s birth mother in the episode’s ending twist. Once Rafael pieces together that his mother is the infamous drug lord, Mutter catches and drugs him. She’s looking for the USB drive that Michael had given Sin Rostro in exchange for Mateo in the season two premiere. Mutter must be pretty desperate if she’s going after her son. As for the rest of the characters, all is right once Petra discovers a key piece of evidence that proves her mother lied to the authorities about who killed Ivan. Michael apparently moved on with a new girlfriend and only wants Jane to be happy, but he did seem like he wanted more than that. Things got a little tender (and heated) between Michael’s partner and Luisa; this can only end badly for them if we’re going by Luisa’s track record. Another packed Jane the Virgin episode, but this time it didn’t quite figure out its tone. It resolved a lot of stuff that was left hanging during the first half; however, the episode mostly worked as a set up for the rest of the season. That’s kind of weird for Jane because there are so many twists and turns that happen in this series, it makes it hard for just one episode to set all of that in motion. First, Rafael will be okay! Second, the narrator teased that Petra would soon feel her mother’s wrath for turning her into the police. My theory for this week is simply that she will be season three’s main villain. “It should be noted that…”Jane the Virgin airs Mondays at 9/8c on The CW.